You might feel uncomfortable with the title statement, but trust me this is what my culture, my society and my community has taught me. The reason behind it is the fear of shame of my family. The fear is all about being boycotted from society because there are still people in the 21st century who believe that "if a girl is being assaulted sexually, it's definitely her fault." This might sounds crazy to you, but unfortunately it is a brutal truth in my culture. The joyous celebration of the Bengali's biggest festival -- Pahela Baishakh -- was tainted by incidents of sexual assault on women on the Dhaka University campus Tuesday evening, sparking widespread public outrage. 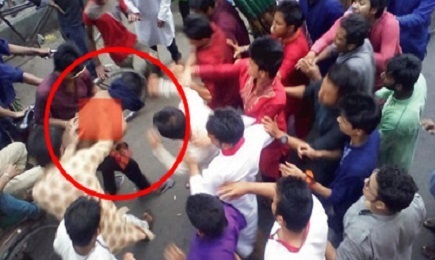 Witnesses said some 30 to 40 rowdy youths assaulted and sexually harassed around 20 women for about two hours at the Suhrawardy Park gate near the Teacher and Student Center area around 6:00 pm. 'The youths were divided into three groups and each group had 10-12 of them. People everywhere around were blowing vuvuzela so loudly that nobody could hear the victims' cry for help,' he said, adding thousands of people were milling around the area, making it difficult for them to prevent the attackers. Masudur Rahman, another Student Union activist, said they could not recognize anybody due to the lack of light at dusk. Amit and Masud said their group caught five of the offenders and handed them over to the police. When they inquired about them two hours later, police told them that all of them had been released. Of the five, two were Dhaka University students. Contacted, police officer said when they went to the place after hearing about the incident, they did not find anyone involved in the assault. 'None came to us with any complaint [of sexual harassment],' he said. Now I am delivering the latest news to you. Days after the incident, police still could not even identify the culprits! Why would the culprits be identified? It is as if they are invisible beings on this Earth. They probably walk under the invisibility cloak of a powerful politician or maybe a business magnet. Therefore there is no punishment for them. On the other hand, no wonder some of the victims might attempt to suicide as they have nowhere to go and share. I believe this is the high time to raise our voices and shout louder against sexual assault. We cannot let the culprits fly freely in our society. I am going to raise my voice against this and against every sexual assault that happened behind the door of my house. I believe you will raise your voice too.